While the objectives of good performance and low cost presented many design challenges, the quality requirement provided many discussions but very few compromises. The counters had to be rugged and dependable. The two instruments were going to carry the HP label and therefore the tradition of reliability and quality established by the more expensive HP counters had to be continued in these two products costing only a few hundred dollars. It was obvious to all involved with the low-cost counter project that the only way the cost objective could be met and the performance and quality standards maintained would be to employ the most efficient production and testing techniques available. Since the best source of this information was the production personnel themselves they were involved during the early stages of the instruments' design. All aspects of the production process from printed-cir-cuit board construction to board loading, from component selection to final assembly, and from pretesting to final testing had to be explored for the most efficient methods. The printed-circuit boards were designed as suggested by the production experts to make them easier to load and solder. Analysis showed that time could be saved by eliminating pretesting for all components except the display board and by designing dedicated testers to speed final testing. The quality objective implied that the counters had to carry the standard HP warranty of one year on parts and labor. To achieve this objective, it was necessary to assure that when a counter did require repair, servicing could be accomplished easily, rapidly, and at low cost. As a result, the service engineer was involved during the initial design states. His early involvement meant not only that the instrument would be easily serviced but that the operating and service manual would help keep both the need for servicing and the attendant costs to a minimum. The service engineer made many recommendations for lest points and for redesigning the printed-circuit boards to make the test points easier to find and more accessible. In the manual, test points are emphasized on schematic diagrams, and waveforms and truth tables are incorporated into the schematics. The manual contains information for users not familiar with common electronic equipment—for example, explanations of BNC connectors and shielded cables—and more applications information than is usually provided. The new low-cost HP counters are Models 5:)fllA and 5382A, Fig. 1. They represent a significant contribution to the state of the art, not in sophisticated circuit design or esoteric performance, but in the careful optimization of all facets of the design. Fig. 2. Large-scale integrated Circuits reduce tlte number ot components, hereby reducing assembly costs and simplifying troubleshooting reveals their simplicity. There are no gate lights, annunciator lights, sample rate controls, multiple inputs, time measurement capabilities, or BCD outputs. It is amazing how fast costs can increase as things get more complicated. More integrated circuits inevitably mean more printed-circuit boards, more power supply capacity, longer assembly time, lower reliability, and more difficult troubleshooting and repair. Great care was taken to keep hand-wired connections to a minimum. In the design of the timebaseand decade counter, two approaches were considered— many inexpensive integrated circuits or a few expensive ones. On an initial cost basis the former looked slightly better, but because it meant increased board-loading labor and more difficult troubleshooting, the LSI approach was chosen. Two low-power MOS LSI IC's replace 25 TTL MSI IC's (Fig. 2). Another cost-cutting philosophy was to minimize research and development. Not having to repay a large research and development expenditure and not spending a lot of money on special tooling or custom integrated circuits mean lower prices. The new counters use as many standard commercial components as possible and borrow many parts from other HP counters. For example, the timebase and decade counter IC's and the sturdy cast-aluminum case come from the 5300A. 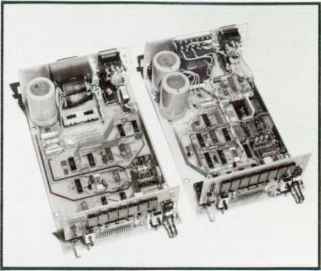 The only parts unique to the 5381A and 5382A are the front and rear panels and the power transformer. Using standard parts also shortened the time from inception to introduction and is expected to increase reliability. ume is high enough that prices are lower than for lower-grade parts used in smaller quantities. Also, non-standard or lower-quality parts would probably raise the warranty costs more than they might reduce initial costs. All resistors have 5% tolerance, electrolytic capacitors are of an industrial grade, and tantalum capacitors are used where possible. The resolution of a direct-count frequency counter is dependent only on the gate time selected, not on the number of digits in the display. However, it is more desirable and convenient to have many digits; this gives maximum resolution without the ambiguity inherent in overranging. At first, it seemed that more digits would mean higher costs because of the additional light-emitting diodes, integrated circuits, power supply capacity, and labor that would be required. However, when five-digit and seven-digit versions of the 5381A were compared, the costs were surprisingly close. This happened because seven digits make certain design economies possible. The seven-digit counter makes effective use of a proprietary HP six-decade counter/ iatch/multiplexer LSI integrated circuit. This IC not only costs less than the equivalent TTL IC's, but also saves assembly labor, board space, repair lime, and power. Fig. 3. 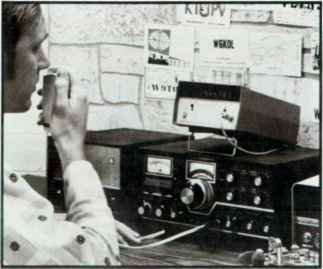 Amateur radio is one 0/ the applications for Model 5382A. VHF television is another Model 5381A is suitable tor commercial mobile radio and citizens band slide switch could be used. Because of the small price differential and large gain in convenience, the seven-digit 5381A was chosen. The 5382A has eight digits for the same reasons. To provide maximum versatility and value the highest count rates commensurate with cost were desired for the two counters. Count rates above 80 MHz require the use of ECL (Emitter Coupled Logic) circuitry. The special ECL power supply and many signal level translations required to interface with the TTL control circuitry made this approach too expensive for the 5381 A. Therefore, the 5381A uses the fastest available TTL counter decade. The trade-off in the 5382A was somewhat different. Above 225 MHz costs skyrocket because the inpuf frequencies become high enough to require special input amplifiers and impedance matched inputs. Furthermore, most customers who need higher count rates need it much higher, say 500 MHz or so. The 225 MHz cutoff was chosen to cover as many of the VHF communications bands as possible without incurring inappropriate costs. At first, very high input sensitivity sounds like a good idea. However, there are at least two drawbacks: it is expensive and it can lead to measurement problems for many customers. To illustrate the latter point, suppose one has a counter that has lOmV rms sensitivity and wants to measure a 10V rms signal. That 10V signal will have to have better than a 60-dB signal-to-noise ratio to guarantee correct counting (60 dB below 10V is lOmV). In practical situations, few signals are as clean as this. For these reasons we chose to provide moderate basic sensitivity and to spend extra money on frequency-compensated attenuators to help cope with noisy signals. A precision crystal oscillator is the heart of any frequency counter; the absolute accuracy of the numbers displayed is directly dependent on the oscillator accuracy. Both counters' standard crystals are specified to have a low aging rate; this cost more but was justified by the longer periods between recalibra-tion—a good price/performance trade-off. The crystal in the 5381A may have four times as much temperature variation as that in the 5382A. This is not because it is an inferior crystal, but because its lower resonant frequency is more difficult to control. 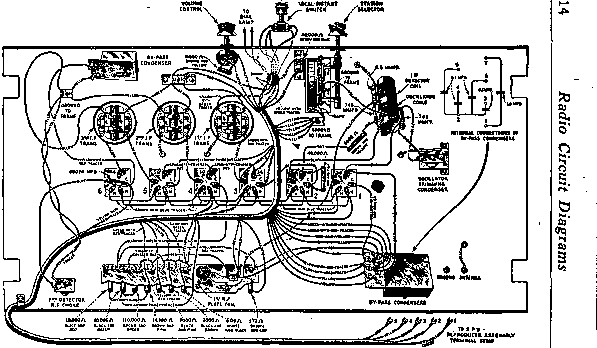 It was used because the lower frequency greatly simplifies the oscillator-timebase circuit. cy range and resolution. For extra accuracy in such jobs as checking radio transmitters for FCC compliance. the 53f)2A/Option 001 is available. This is a high-stability temperature-compensated crystal oscillator (TCXO) that has an appropriately low aging rate. Born in New York City, Warren OBuch attended Columbia University there He received his BS degree in 1964 and his MS in 1966. both in metallurgical engineering, then speni three years in the U.S. Marine Corps serving as a company commander A civilian again. Warren worked as a systems analyst before enrolling at Stanford University for his MBA degree, which he received in 1971 At HP since 1971, Warren has been a systems analyst. IC department accounting manager, division cost accounting manager and low-cost-counter product manager He has just been named division materials manager. A member of AIME. Warren lives in Cupertino, California with his wife of two years. Tennis, golf, and backpacking are his choices for recreational activities. Salt Lake City native Lew Masters graduated from the University of Maryland in 1966 with a BS degree in mechanical engineering In 1969. he received the M$ degree in electrical engineering from the University of California at Santa Barbara. 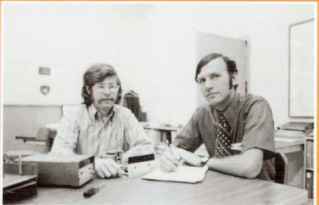 With HP since 1970. he has designed two functional modules for the 5300 Measuring System, assisted in the design of two others, and designed the 5381A and 5382A Counters He and his wife have recently acquired a home m Los A:tos. California so Lew is currently spending most of his spare time remodeling, building furniture, and gardening Eventually. however, he hopes to find more time to indulge his interests in building hi-fi equipment and working on cars.